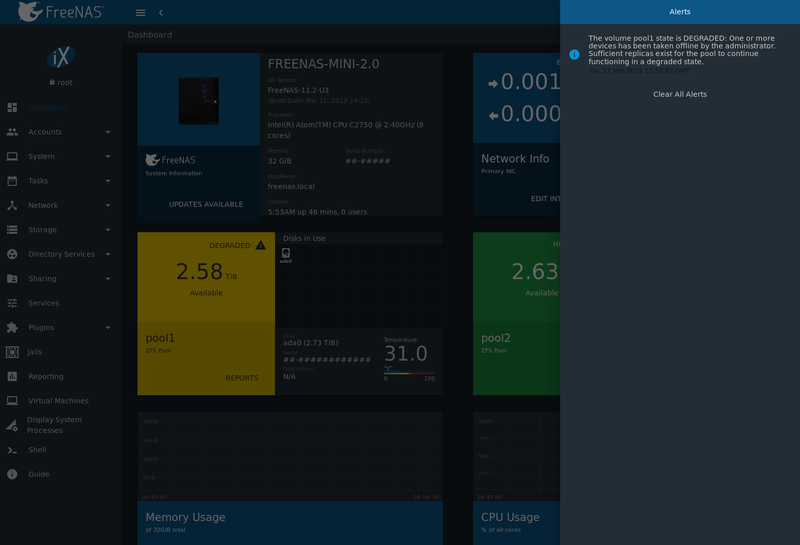 The FreeNAS® alert system provides a visual warning of any conditions that require administrative attention. The Alert icon in the upper right corner has a notification badge that displays the total number of unread alerts. In the example alert shown in Figure 20.1, the system is warning that a pool is degraded. Table 20.1 shows the icons that indicate notification, warning, and critical alerts. Critical messages are also emailed to the root account. Close an alert message by hovering over it until Click to Dismiss appears. There is also an option to CLEAR ALL ALERTS. Close all messages to remove any notification badge from the alerts icon. Behind the scenes, an alert daemon checks for various alert conditions, such as pool and disk status, and writes the current conditions to the system RAM. These messages are flushed to the SQLite database periodically and then published to the user interface. Current alerts are viewed from the Shell option of the Console Setup Menu (Figure 3.1) or the Web Shell (Figure 18.1) by running midclt call alert.list. Notifications for specific alerts are adjusted in the Alert Settings menu. An alert message can be set to publish IMMEDIATELY, HOURLY, DAILY, or NEVER.